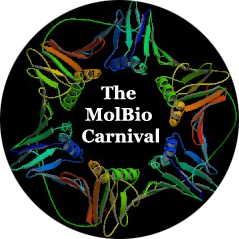 Welcome to the third edition of the MolBio Carnival! This time around, we have an additional section you can find at the end of the post – blog posts on molecular biology in German! The German science blogosphere is actually doing quite well, and if you speak the language, fell free to look around here at the German Scienceblogs, or over at Scilogs.de for a start. We’ve got some great posts lined up, so let’s jump right into some molbio action! 1) Some of you may know archaea of the genus Thermococcus from their thermostable DNA polymerases you use in your PCR. A few Thermococcus species could in the future perhaps also help us with our renewable energy needs. As Michael Scott Long tells us in his blog “Phased“, Thermococcus onnurineus NA1 can grow using only formate and water, thereby producing ATP, bicarbonate and hydrogen. It is tempting to think about exploiting this form of living to produce hydrogen for stuff like fuel cells. Go check out Michael’s post for more information about these interesting archaea! 2) David Garcia from “You’d Prefer An Argonaute” writes about a new method to analyse how RNA molecules fold into secondary structures. There are a few methods to do this around, so why should one more on the list be interesting to us? Well, the new one uses next-generation sequencing to look at RNA folding on a whole-genome scale! David presents the paper in a journal club style, summarizing the interesting new data and methods, but also discussing some of the shortcomings. 3) Next up, we have a series of posts by Christopher Dieni at “Bitesize Bio” on the protein modification many of you probably know and love – phosphorylation. In the first post, he gives an overview of the topics he will write about in the following posts: which methods to use to study phosphorylation and dephosphorylation, which protein kinases there are and what they do, and of course also how the other side of the phosphorylation coin works, the phosphatases. In the second part of the series, Christopher takes an in depth look at the strategies and methods you can use if you want to know more about protein phosphorylation in your work. You want to look at the phosphorylation of a specific amino acid in you protein of interest? Or do you want to have a more global overview of phosphorylation? Perhaps it’s kinetics you are interested in? Find tips on how to tackle these problems in the second post! By the way, the malachite green assay described in his post is a nice method not only to study traditional phosphatases, you can use it to check for the activity of ATPases as well! Just a few days ago, Christopher posted part 3 in his phosphorylation series. This one is about the many protein kinases we know about; how they know where to put the phosphate on their target proteins and into which families they are grouped. 4) Our own Lab Rat (who will host the MolBio carnival in December) submitted a post about a rather strange way of cell division in bacteria. Contrary to a division by a contracting ring of the tubulin homolog FtsZ, which is more or less the way people thought all bacteria divide, there seem to exist several different strategies. Some look superficially similar, but use proteins other than FtsZ. Others seem to be much more brutal: When researchers took away FtsZ from Mycoplasma cells, they still could divide, just not by forming a constricting ring. They simply start moving two cell ends in two different directions, until the cells tear itself into two daughter cells! 5) Although I never worked with Xenopus egg extracts myself, I always found the technique fascinating. 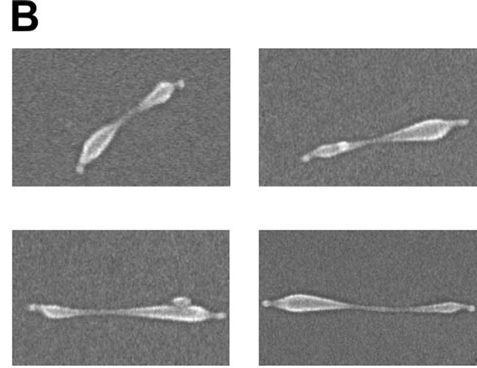 That’s why I liked to read about using egg extracts to study the factors involved in actin filament nucleation in Becky Ward’s post “Dancing filopodia” at “It Takes 30“. It turns out, if you put the egg extract onto a flat lipid bilayer, a few actin nucleation proteins will start to assemble actin filaments right there on the spot. And you can even observe the growth of these filaments with a cool technique, TIRF microscopy – go have a look at a video of wriggling actin filaments at Becky’s post! 6) Becky submitted another post from “It Takes 30“, this one about microRNAs and the seemingly endless debate on how they work. Translational inhibition, or mRNA destabilization? While this story is much more boring on the plant side, because it was shown several times that miRNAs mostly lead to the degradation of mRNA, on the animal side of life it wasn’t as clear. The majority thought that inhibition of mRNA translation by blocking ribosome access was the way animal miRNAs worked, which even led to speculation if there were fundamental differences between animal and plant miRNAs. As Becky explains, the more recent papers looking at the fate of mRNA targets of a few animal miRNAs in a more global way came out on the other side, arguing for mRNA destabilization as the major factor of miRNA action in animals. What’s your take on the controversy? 7) Some of you perhaps know that I’m doing my PhD in plant genome stability. I’ve read papers by Cédric Feschotte before, mostly on how plant transposons influence genome size. So I was pleasantly surprised to see him work on other elements of eukaryotic genomes, also outside of plants. GrrlScientist writes in “Punctuated Equilibrium” about Feschotte’s work, together with Clément Gilbert, on virus fossils in bird genomes. The story is fascinating in several ways, starting with the type of virus this research was about. Usually, the viral remnants you can find in genomes are from retroviruses – here, it is a DNA virus related to the hepatitis B virus. As it turns out, these viruses are much older than was previously thought based on extant viruses alone. They also seem to be evolving much more slowly than other viruses, as a comparison of the old sequences in the bird genomes with their relatives of today showed. Great stuff! 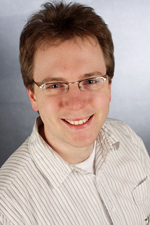 8) Finally, Nir London of the “Macromolecular Modeling Blog” tells us about the importance of peptide-protein interactions in a first of a series of posts he has planned. Instead of the usual interactions of proteins with other folded protein domains most of you know about, there are also proteins that bind to short linear peptides. Those peptides are more flexible on an evolutionary timescale, and proteins often recognize many diferent peptides. As Nir writes further on, research on the role of different peptides in the cell could lead to new therapeutic routes as well. These are our English submissions for the month, but I still have a few molecular biology blog post left – in German! If you don’t speak the language, head on down to the end of the post for information about the next issue of the carnival, and where to submit your blog posts. So, jetzt kommen wir wie versprochen noch zu den deutschsprachigen Blogposts! 9) Joe Dramiga schreibt auf seinem Blog “Die Sankoré Schriften” über das spannende Thema Protein-Spleißen. Es gibt erste Hinweise, dass es in Wirbeltieren nicht nur vorkommt, sondern womöglich sehr häufig sein könnte. Die daraus abgeleitete Polypeptid-Rearrangement-Hypothese zeigt uns ziemlich weitreichende Folgen auf Grundlagenforschung und auch Medizin, falls sie sich bewahrheitet. 10) Gleich neben Joe, nämlich auch auf den Wissenslogs, hat Sebastian Reusch auf “Enkapsis” über die RNA-Interferenz gebloggt. Eins von den vielen Themen, das zunächst in Pflanzen entdeckt und untersucht wurde, für das dann aber Forscher mit Tiermodellen den Nobelpreis bekamen. Grrrr. Neben einer schönen Übersicht über die Grundlagen erzählt uns Sebastian auch ein wenig über erste Versuche, RNAi medizinisch anzuwenden. Das Video über die Grundlagen der RNAi ist so toll, das muss ich hier auch einbauen! That’s it for this month’s edition of The MolBio Carnival. You can check future hosts and past editions on the Carnival’s home page. Be sure to subscribe to the RSS feed to receive notifications and summaries when new editions of the Carnival are posted. Also, you are welcomed to submit your best molbio blog articles to the next edition of The MolBio Carnival which will be hosted by Psi Wavefunction at Skeptic Wonder. More info here. Thanks for hosting the 3rd edition of MolBio Carnival! Next time I´ll try to submit a post in German and in Englisch to see, how that would work! By the way, cheers to all the other authors…we should keep this carnival going, because it´s simply cool! Thanks a lot for hosting this edition of the Carnival, Alex! As always, I’m quite honoured and privileged to be featured, and in the company of so many awesome authors and their blog posts. Congrats to everyone featured on here! Now… to see if I can click the right button to make this post work. Ooh, thank goodness for Google Chrome page translator! Hi! Awesome job! Love the inclusion of some German posts as well. You got one detail wrong though, the next edition is the November one, which is hosted by Psi Wavefunction at Skeptic Wonder (http://skepticwonder.fieldofscience.com/). I’m hosting in December 🙂 The link for submissions is the same though. Thanks a lot Alexander for putting this up! Ten blog posts….Lawd hav mercy ! @Joe: Hmm, a carnival ebook! Great idea, we should think about doing something like that. Perhaps one every 6 or 12 months or so. Very impressive article, thanks a lot. Find ich ja toll, dass Linkspammer sich heute auch für ungewöhnliche Mechanismen der bakteriellen Zellteilung interessieren! Man würde ungern seine informell in die Runde geworfenen Entwürfe in den Anträgen anderer ausgearbeitet sehen! !